Hospital disinfectant/deodorant is highly effective against TB, MRSA, influenza A (H1N1), norovirus, hepatitis A, poliovirus type 1 and HIV-1 (AIDS virus). 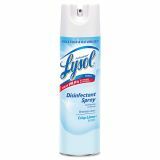 Professional LYSOL Brand Disinfectant Spray, Crisp Linen, 19oz Aerosol, 12 Cans/Carton - Lysol kills 99.9 percent of germs on hard, nonporous surfaces within 30 seconds. Formula is tuberculocidal, virucidal, fungicidal and bactericidal; and effective against TB, MRSA, norovirus, poliovirus Type 1, HIV-1 (Aids Virus), and Hepatitis A and B. Prevents growth of mold and mildew. Meets AOAC germicidal spray standards for hospital aerosol disinfectants and OSHA Bloodborne Pathogens Standards for decontamination. 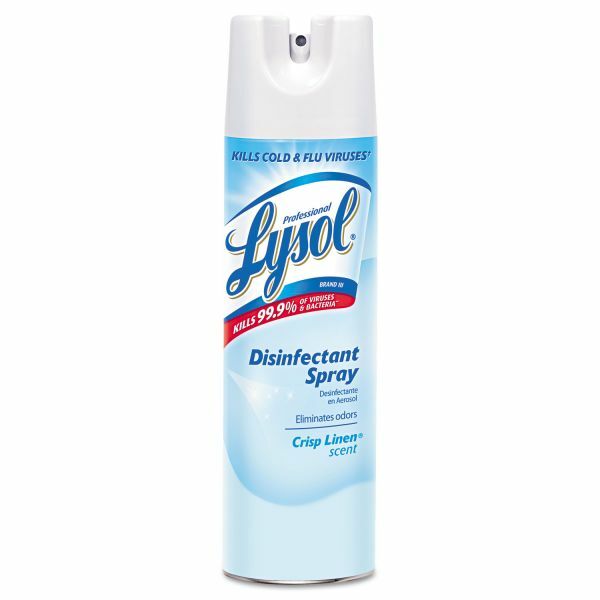 Lysol contains no chlorofluorocarbons. Prevents odors and growth of mold and mildew.